Researchers from the University of Illinois at Urbana-Champaign have developed a new technique for extremely high speed photonic sensing of the mechanical properties of freely flowing particles using an opto-mechano-fluidic resonator (OMFR). This research potentially opens up completely new mechanical “axes of measurement” on micro/nanoparticles and bioparticles. 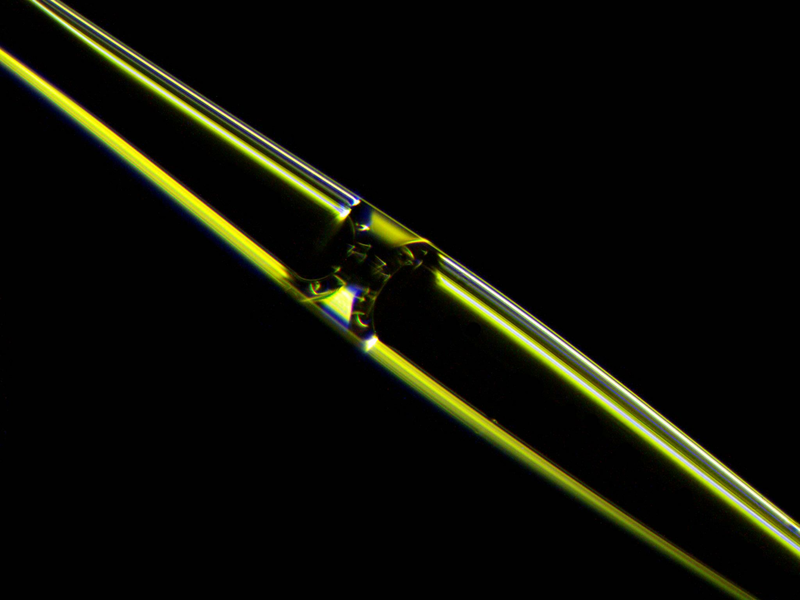 Photograph of a fluid meniscus inside an opto-mechano-fluidic resonator (OMFR) made of high purity silica glass. Particles flowing through the internal microchannel can be detected optically at extremely high speed. High-speed optical detection methods, such as flow cytometry, are routinely used for analysis of large populations of particles through measurements of their optical properties, with analysis speeds approaching 50,000 particles/second. Optical sensors, however, cannot directly measure any mechanical properties of the particles (such as mass, density, compressibility, stiffness, etc). Until now, mechanical sensors have not approached the speed of optical flow cytometers, which makes routine measurements on large cell populations simply impractical. “In this study, we aimed to blend the best features of optical sensing, i.e. 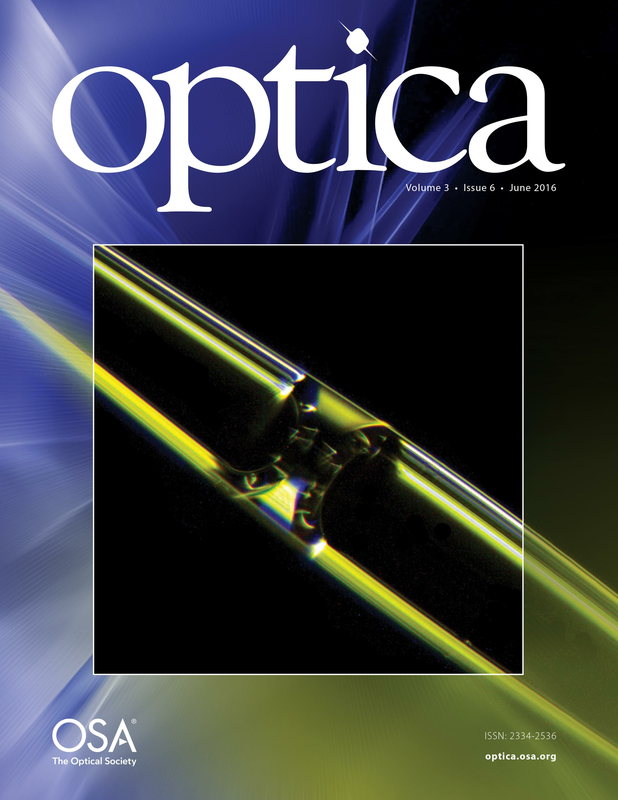 the extremely high bandwidth and sensitivity, with mechanical sensing which gives us the ability to measure mechanical properties,” stated Kewen Han, a doctoral candidate and first author of the cover article appearing in the June 2016 edition of Optica. “To achieve this, we have developed a new microfluidic opto-mechanical device that optically detects the mechanical perturbations created by individual microparticles flowing through the fluidic channel at very high speed. Using bakers’ yeast and two types of microbeads, the researchers explored the particle-sensing capabilities of the OMFR. 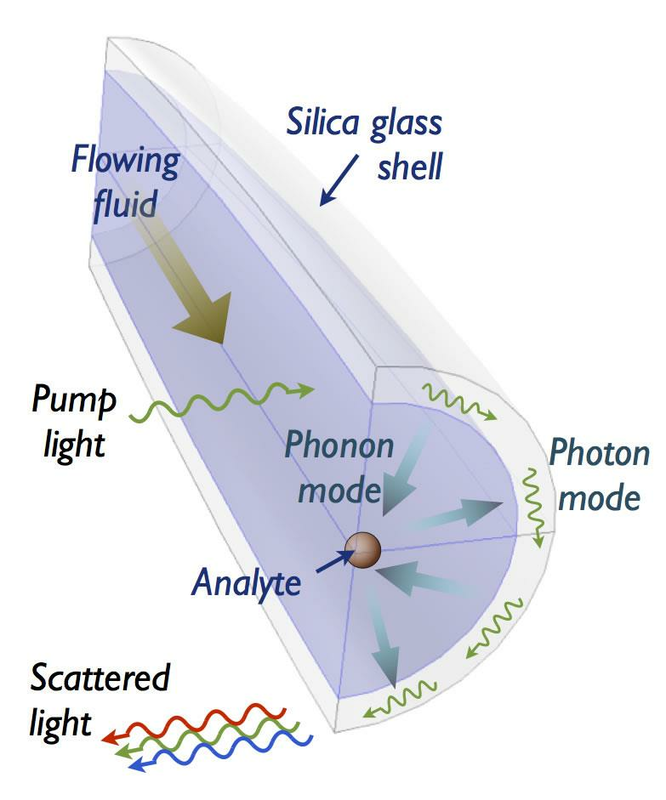 OMFRs employ phonons (quasiparticles of sound and vibration) to engage the conversation between the flowing analyte particles and circulating photons (particles of light) in the silica glass shell. In doing so, they make light sensitive to the mechanical parameters of the analyte. “We have shown that our technique is sensitive to the density and compressibility of each individual particle as it passes by,” Bahl added. “The smallest detectable particle as reported in this work is around 660 nm. The paper, “High-throughput sensing of freely flowing particles with optomechanofluidics,” is available online. The research was supported by National Science Foundation grants ECCS-1509391 and ECCS-1408539. Contact: Gaurav Bahl, Department of Mechanical Science and Engineering, University of Illinois at Urbana-Champaign, 217/300-2194.